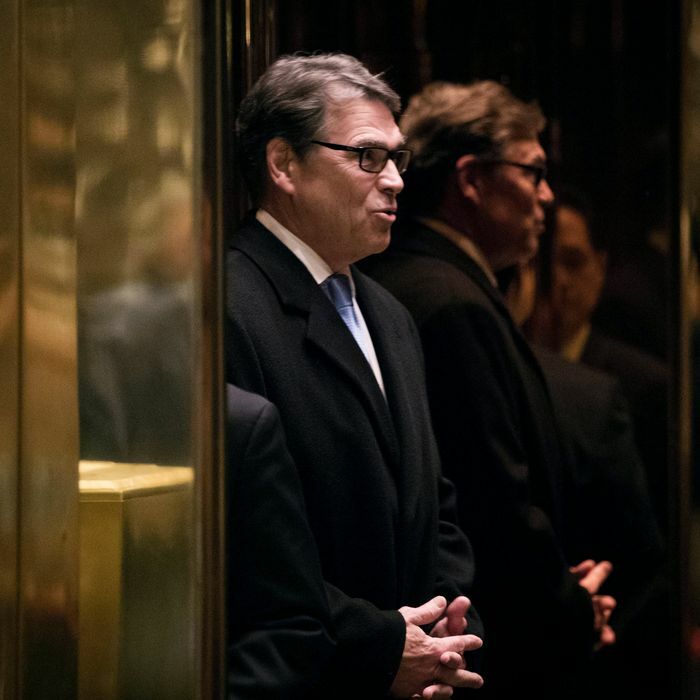 Yesterday, the New York Times posted a story by Coral Davenport and David Sanger about Donald Trump’s energy secretary nominee, former Texas governor Rick Perry, that quickly went viral. That’s because the article, posted under the headline “‘Learning Curve’ As Rick Perry Pursues a Job He Initially Misunderstood,” made a rather astounding claim: that at the time he was tapped to head the department, Perry didn’t even understand that one of its primary purposes is to maintain the security of America’s nuclear weapons and facilities. Journalists everywhere, myself included, tweeted out the story as just another bright-red data point about Donald Trump’s lack of fitness to govern. But since the story went online, a bunch of (mostly) conservative critics and outlets has argued that the story falsely impugns Perry. They make a very convincing case. WASHINGTON — When President-elect Donald J. Trump offered Rick Perry the job of energy secretary five weeks ago, Mr. Perry gladly accepted, believing he was taking on a role as a global ambassador for the American oil and gas industry that he had long championed in his home state. Two-thirds of the agency’s annual $30 billion budget is devoted to maintaining, refurbishing and keeping safe the nation’s nuclear stockpile; thwarting nuclear proliferation; cleaning up and rebuilding an aging constellation of nuclear production facilities; and overseeing national laboratories that are considered the crown jewels of government science. Two things jump out: First, nothing in the first three paragraphs — the part of the story communicating the headline assertion that Perry fundamentally misunderstood the job — has any attribution, which is fairly unusual for this style of news story. Usually, you’d expect an “according to sources close to …” type of clause in there somewhere. Second, the clearest plain reading of the second paragraph — no such thing paired with in fact — really does suggest that Perry misunderstood not only the specifics of the job, but rather its basic mission, and it would be difficult to interpret it otherwise. That criticism relies on a specific reading of those ambiguous top four paragraphs: that the source for the first three was McKenna, who is introduced in the fourth. While that’s a plausible interpretation given that no other attribution is provided, there’s just no way to know for sure that this is the case given the total lack of attribution (the Times story desperately needs some editing to clear up where that claim came from). None of this, of course, changes the fact that it makes zero sense to tap someone as unqualified as Perry to a position that has, as the Times story points out, in the recent past been held by experts with deep knowledge of nuclear energy and security — it really could be dangerous. And it may well be that Perry misunderstood many of the responsibilities of the job he may soon be stepping into, believing them to have a lot more to do with oil and natural gas than they really do. But criticisms of Trump’s appointees should rest on supported claims, and this one seems flimsy. This doesn’t really clear anything up. The importance of attribution is one of the most basic norms in news writing, and those top three grafs are still sitting there without any. A single clause along the lines of “Multiple people close to Perry …” connected specifically to the claim that he didn’t know the Department of Energy oversaw nuclear-weapon security would have gone a long way toward clarifying things, and could have prevented the confusion over whether that claim came from McKenna. @ErikWemple Seems odd they'd have "multiple, high-level sources," but never mention that in the body. Why undersell your sourcing? The Times should update the language at the top of the online version of the piece to better explain exactly where that eye-popping claim came from, plain and simple.